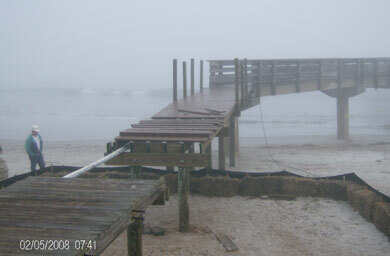 Description:Furnish labor, equipment, supervision and material to remove existing boardwalk decking, railings, and replace incorporating ADA slopes and landings. Weather seal all surfaces. 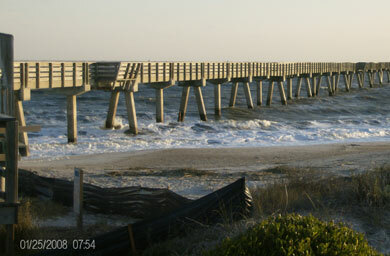 Salvage and notch all boardwalk pilings. Strip marine growth, inspect and document damage to all pilings, implement repair for affected pilings. Install piling jackets with cathodic protection. Refurbish concrete caps and bath house. Supplied and installed solar lighting. The quality of work was excellent, and the work was completed on-schedule and within the budgeted amount. Worth has demonstrated excellent cooperation and teamwork, including their immediate response times for emergency repair work.Howard 'Buff' Searcy, Jr.
Worth Contracting, Inc. Copyright ©2002 Worth Contracting, Inc. All rights reserved.